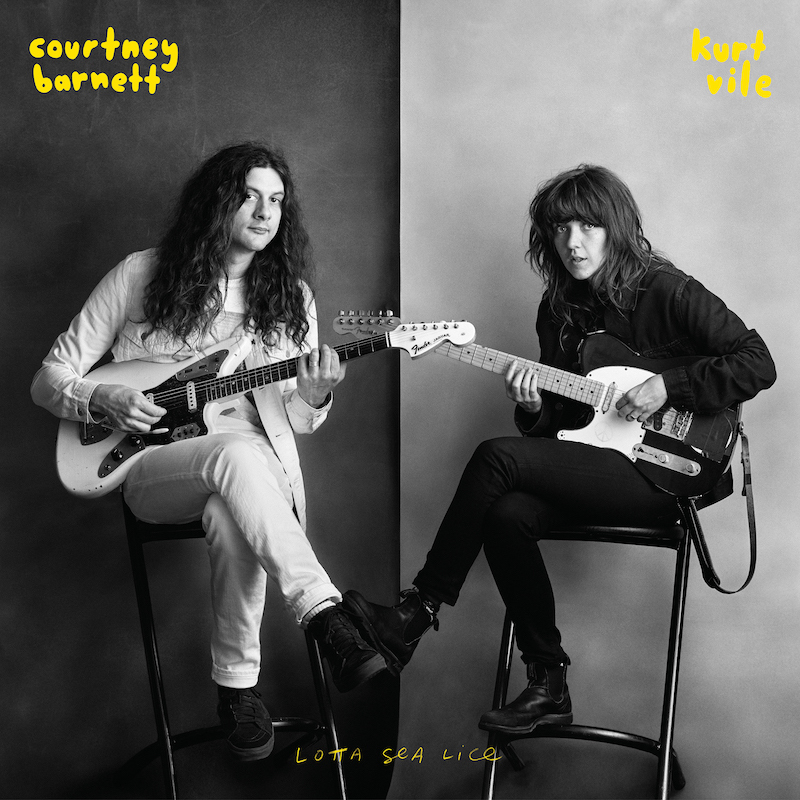 'Lotta Sea Lice' is the result of 8 days in the studio spread over almost 15 months when Courtney and Kurt’s respective touring schedules allowed for them to be in the same place at the same time. I’m a huge Kurt Vile fan, have been since I walked into Thornbury Records one morning and blindly bought Smoke Ring For My Halo. That album was one of my first purchases on vinyl. I was getting over a big break-up, un-employed and drifting. I would just lie on my bed and listen to Peepin’ Tomboy on repeat. One of the most beautiful and luscious albums I ever heard. Me and Jen fell in love to that album. While the violators were touring Australia during the Walkin On A Pretty Daze era I was hearing Courtney’s name a lot. 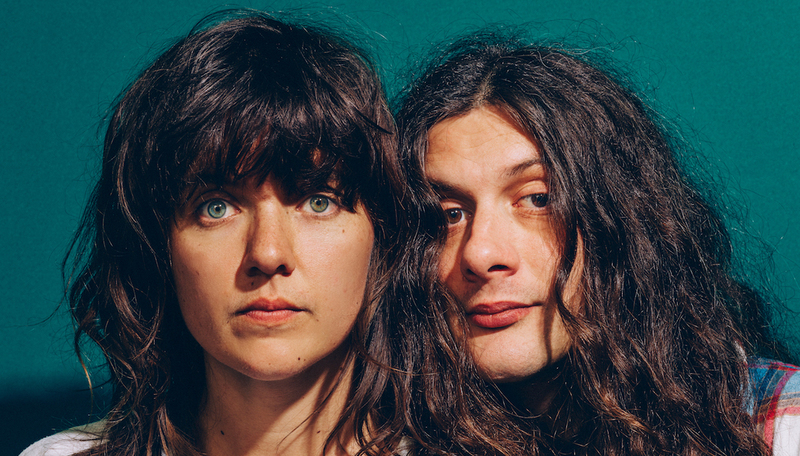 We added an extra show in Melbourne and the CB4 (Courtney’s band) were added to open the show. I scored a support slot opening for Kurt at the Abbotsford Convent. We met briefly after the show but I was a bit nervous and didn’t wanna bother him, just grateful for the gig. After the show Courtney gave me her double vinyl EP. The first song was Out Of The Woodwork. I love how sort of slow and swaying it is, pretty but dark with disorienting lyrics. I love all her music but the song that really hit me on her next album was Depreston. I’m a sucker for that kinda song: instant classic. So pretty and sincere. We started bumping into each other on the festival circuit all around the world and we became friends. He hit me up when he was coming to Melbourne again. He said he had a song that he thought we could work on together. We started sending demo’s back & forth. I started writing a tune that I hoped she’d do with me one day. I was doing promo for B’lieve I’m Going Down and being photographed in Philly with my acoustic and literally writing a song I had in mind for her (Over Everything) with the idea of alternating lines and everything. She agreed (to collaborate) and wrote a song too (Let It Go). That was that! Let It Go is another example of the pretty but sort of sad song style i love by her. It started out as maybe we’ll do a split 7” but then I figured let’s make it a 12” so it doesn’t get lost in the world, shoot for 5 songs. I was country-music-dorking-out and obsessed with roots music at the time so I convinced everyone that we should do a cover of Blueberry Hill. We had the two originals and the Blueberry Hill cover then Courtney suggested we cover each other so the plan was to work on those songs on our own. It was just so fun the panic drifted away. Kurt’s so encouraging and silly so all this confidence that I had lost was re-ignited, I think I knew deep down it would kick-start my brain. We were originally gonna do a kinda acoustic folk duo thing, then Kurt was like “is it ok if my friends Mick and Jim come jam with us?” so next minute we’re jammin with Rob (Kurt’s bass-man) and two members of the Dirty Three and we’ve started gathering a pile of songs. The band was me, Courtney, my bass player Rob Laakso and I invited Mick Turner and Jim White, two new friends from touring. It was amazing playing with Mick and Jim of course! Then the Violators left for more shows. 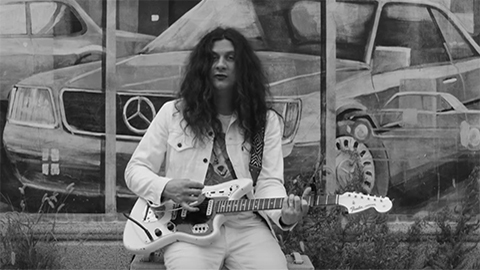 Jump forward a year, Kurt’s back in Melbourne so we book another 3 days and record some more half-cooked ideas (this time with Stella Mozgawa from Warpaint) and eventually we’ve got about 10 songs stewing, some covers, some originals. very live and spontaneous but mostly just a bundle of fun. We ran into each other on the road in various continents and talked about the recordings. I guess it wasn’t till i had another tour booked for the following summer in Australia that we thought we should record as much as we can, no major goal to make it a full length but it came together that way because the vibe was so strong. Callum (Barter) the engineer was amazing and crucial to the laid back atmosphere as well. I love working with Courtney, the collaboration was laid back with less pressure. There are some great guests too. Mick and Jim and Rob of course but also Stella Mozgawa and Mick Harvey. Backing vocals from Jade Imagine and Jess Ribeiro, and Dave and Bones from Courtney’s band. 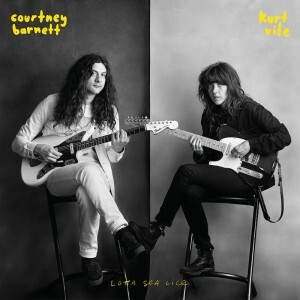 Now we finished the album, we dreamt up an amazing band which we’ve called THE SEA LICE (inspired by a Stella Mozgawa beach-side-story) and me n Kurt will be standing there out front with our guitars singing songs together. Songs from this album we did, a handful of our own songs from previous albums, maybe some old folk songs n what not. Harmonies and guitarmonies galore. Very collaborative.